dDepartment of Radiology (B.E.-W.), University of Munich, Munich, Germany. BACKGROUND AND PURPOSE: Impaired CSF homeostasis and altered venous hemodynamics are proposed mechanisms for elevated pressure in IIH. However, the lack of ventricular expansion steered the focus away from CSF homeostasis in IIH. This study aims to measure intracranial CSF volumes and cerebral venous drainage with MR imaging to determine whether increased CSF volume from impaired CSF homeostasis and venous hemodynamics occur in obesity-related IIH. MATERIALS AND METHODS: Two homogeneous cohorts of 11 newly diagnosed pretreatment overweight women with IIH and 11 overweight healthy women were prospectively studied. 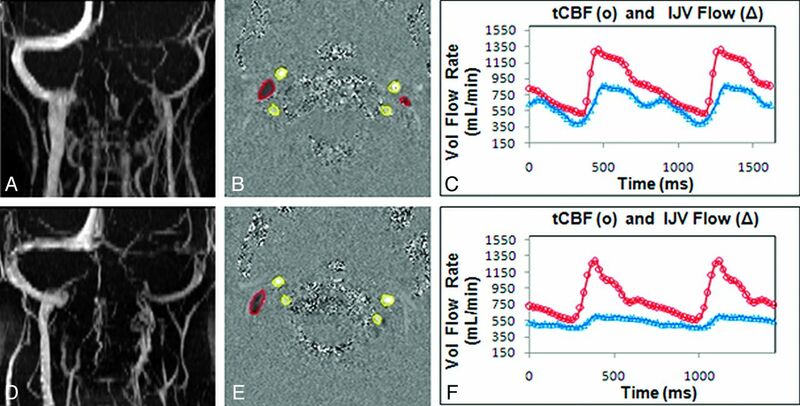 3D volumetric MR imaging of the brain was used to quantify CSF and brain tissue volumes, and dynamic phase contrast was used to measure relative cerebral drainage through the internal jugular veins. RESULTS: Findings confirm normal ventricular volume in IIH. However, extraventricular CSF volume is significantly increased in IIH (290 ± 52 versus 220 ± 24 mL, P = .001). This is even more significant after normalization with intracranial volume (P = .0007). GM interstitial fluid volume is also increased in IIH (602 ± 57 versus 557 ± 31 mL, P = .037). Total arterial inflow is normal, but relative venous drainage through the IJV is significantly reduced in IIH (65 ± 7% versus 81 ± 10%, P = .001). CONCLUSIONS: Increased intracranial CSF volume that accumulates in the extraventricular subarachnoid space provides direct evidence for impaired CSF homeostasis in obesity-associated IIH. The finding of larger GM interstitial fluid volume is consistent with increased overall resistance to cerebral venous drainage, as evident from reduced relative cerebral drainage through the IJV. The present study confirms that both impaired CSF homeostasis and venous hemodynamics coexist in obesity-associated IIH. Surprisingly, measurements of intracranial CSF volumes in IIH are scarce, especially of the extraventricular CSF. An early MR imaging study suggested that both subarachnoid and ventricular spaces are larger in IIH but argued that a wide variability limits clinical utilization for these measurements.9 In addition, limited and inconsistent reports of normative values of extraventricular CSF volumes10,11 confound the question of whether total intracranial CSF volume is increased in IIH. The present study aims to measure intracranial CSF volumes and cerebral venous drainage with MR imaging to determine whether increased CSF volume from impaired CSF homeostasis and altered venous hemodynamics occur in obesity-related IIH. Extra- and intraventricular CSF volumes are measured using semiautomated segmentation of 3D volumetric T1-weighted imaging, and venous hemodynamics are assessed using phase-contrast and volumetric flow measurements of total arterial inflow and venous outflow through the jugular veins. A homogeneous cohort of overweight women of childbearing age with a confirmed diagnosis of IIH, as per the modified Dandy criteria,12 and an age- and weight-matched cohort of control subjects were prospectively enrolled. All study participants provided written informed consent, approved by the institutional review board, before participation in the study. A total of 11 newly diagnosed untreated patients with IIH (mean age 29 ± 9 years, age range 17–44 years; mean body mass index 34.2 ± 5.1 kg/m2, range 23.9–41.2 kg/m2) and 11 healthy women (mean age 31 ± 9 years, age range 22–50 years; mean body mass index 36.6 ± 4.9 kg/m2, range 30.9–48.4 kg/m2) were studied. Detailed neurologic symptoms and ophthalmologic assessments were obtained before the MR imaging scan and diagnostic lumbar puncture. Nine of 11 patients with IIH reported moderate to severe headaches; 8 patients reported vision-related problems, including blurriness, double vision, transient visual obscurations, and impaired peripheral vision. Bilateral papilledema (range grade 1 to 4) was found in all patients with IIH. The mean opening pressure recorded during the diagnostic lumbar puncture was 37.23 ± 6.87 cm H2O (range 26–47 cm H2O). Control subjects were obese but otherwise healthy, without headache, visual symptoms, or papilledema. CSF and Brain Tissue Volumetric Assessment. MR imaging studies were performed using 1.5 and 3T scanners (Symphony and Trio; Siemens, Erlangen, Germany), both equipped with the total image matrix radio-frequency architecture. Scans were performed before diagnostic lumbar puncture and initiation of treatment. Volumetric assessment of the various cranial compartments was obtained from a 3D T1-weighted sequence (magnetization-prepared rapid acquisition of gradient echo) with an isotropic resolution of 1 mm. The following scan parameters were used: TR of 1700 ms (1900 ms for 3T), TE 3.53 ms (4.6 for 3T), TI 1100 ms, flip angle 15°, and bandwidth of 130 Hz/pixel. Potential for bias due to field strength was assessed by repeated scans in 2 test subjects. Segmentation of the intracranial space into GM, WM, and CSF was completed by a single observer using the FMRIB Software Library package13,14 (FMRIB Software Library, Oxford, United Kingdom; http://www.fmrib.ox.ac.uk/fsl). The brain extraction tool15 was used to automatically identify and separate the cranium from the skull and generate a brain mask. Manual editing by a graduate student with 2 years of experience (S.R.) was used to exclude bone and eye regions, as well as modify inner skull boundaries incorrectly delineated by the brain extraction tool. Segmentation of the edited volume into GM, WM, and CSF was achieved by using the FAST16 tool, based on image intensity distribution. The total intracranial volume was then calculated as the sum of the GM, WM, and CSF volumes. Ventricular CSF volume was quantified by using the 3D Slicer software17 (version 3.6, http://www.slicer.org). The ventricular regions, including the lateral, third, and fourth ventricles, and the cerebral aqueduct were segmented on the same T1-weighted volume. Initially, an automated region growing algorithm was used to extract the ventricles using a predetermined threshold. The resulting volume was then manually edited by the same graduate student to correctly delineate the ventricular boundaries. The extraventricular CSF volume was then computed as the difference between the intracranial CSF volume and the ventricular volume. Volume measurements were also normalized to the total intracranial volume. Assessment of Venous Drainage through the Internal Jugular Veins. A 2-tailed unpaired Student t test was applied to test for significance of differences between volume measurements obtained from the 2 cohorts. The Pearson correlation coefficient was calculated to test for possible association between volumetric measures and severity of headache and papilledema grade. A 1-way analysis of covariance was applied to test for possible biases in the volumetric measures due to the 2 different field strengths used for scanning. The Levene test for equality of variances was performed to assess the data homogeneity required for the analysis of covariance test. Receiver operating characteristic analysis was performed to determine area under the curve and optimal sensitivity and specificity of the normalized extraventricular CSF volume. Statistical analyses were performed using statistical software (MedCalc v12.0.4, Mariakerke, Belgium). Analysis of covariance confirmed that there was no bias or significant differences in any of the volumetric measures due to scanner field strength. An example of sagittal and coronal T1-weighted images without and with the color overlay of the tissue segmentation from representative control and IIH subjects is shown in Fig 1. Relatively larger subarachnoid CSF spaces can be visualized both in the floor of the anterior cranial fossa and in the extra-axial spaces overlying the convexities in the IIH subjects. Mean and SD values of volumetric intracranial GM, WM, and CSF compartments are summarized in Table 1. While ventricular CSF volume is similar in both cohorts (IIH versus controls: 19 ± 6 versus 19 ± 7 mL, P = .95), a significantly larger mean intracranial CSF volume is measured in the IIH cohort compared with the healthy cohort (309 ± 56 versus 238 ± 25 mL, P = .002). This implies that the increased intracranial CSF volume accumulates in the extraventricular spaces (IIH versus controls: 290 ± 52 versus 220 ± 24 mL, P = .0011). Differences in extraventricular CSF volume normalized for the total intracranial volume are even more statistically significant, with a P value of .0007, as these account for the intersubject variability in ICV. Sensitivity and specificity of the normalized extraventricular CSF volume measurements determined by the receiver operating characteristic analysis were 73% and 100%, respectively, with an area under the curve of 0.91. Other significant differences were a larger GM volume in patients with IIH compared with the controls, 602 ± 57 versus 557 ± 31 mL (P = .037), respectively, and a larger total intracranial volume, 1438 ± 124 versus 1332 ± 81 mL (P = .029), respectively. The volume of the WM, on the other hand, was similar in the 2 cohorts, 528 ± 35 versus 537 ± 47 mL (P = .62). Correlations of the volumetric measures with measures of severity of headaches or papilledema grade were not statistically significant. Segmentation of T1-weighted MR images into GM, WM, and CSF regions. Examples of T1-weighted MR images in sagittal (A, E) and coronal (C, G) planes are shown without and with color overlay of the tissue segmentation into GM (blue), WM (yellow), and CSF (red) from a control subject (top row) and a patient with IIH (bottom row). Relatively larger subarachnoid CSF spaces can be visualized in the floor of the anterior cranial fossa and in the extra-axial spaces overlying the convexities in IIH. Mean and SD values of total CBF, volumetric flow rates through the right and left internal jugular veins, and absolute and relative drainage through the jugular veins for the 2 cohorts are summarized in Table 2. Examples of an MRV image of the cervical veins, a velocity-encoded phase-contrast image, and derived arterial inflow and venous outflow through the jugular veins in representative control and IIH subjects are shown in Fig 2. Mean total arterial inflows in the IIH and control cohorts of 823 ± 68 and 789 ± 11 mL/min, respectively, were not significantly different (P = .4). In both cohorts, venous drainage through the right IJV was larger compared with the left IJV. In contrast to arterial inflow, total venous outflow through the jugular veins was significantly smaller in the patients with IIH compared with the control subjects, 532 ± 87 versus 628 ± 72 mL/min, respectively, with P = .01. Normalized jugular cerebral drainage was considerably more significant, 0.65 ± 0.07 and 0.81 ± 0.10, P = .001, because it accounts for the intersubject variability in total CBF. In 2 patients with IIH and 1 control subject, hypoplasia of 1 transverse sinus was seen in the MRV. However, even with exclusion of these cases, significantly lower jugular drainage in IIH is maintained (patients with IIH versus controls: 0.64 ± 0.06 versus 0.81 ± 0.10, P = .0009). Extracranial MRV, arterial inflow, and venous outflow measurements through the IJVs. An example of MRV (A, D) showing extracranial venous drainage; velocity-encoded phase-contrast images (B, E) showing segmentation of the arterial (bright pixels with yellow outline) and venous (dark pixels with red outline) lumens; and derived volumetric flow rate waveforms (C, F) for total CBF (red) and IJV outflow (blue). Data shown are from a representative control subject (top row) and a patient with IIH (bottom row). Volumetric IJV outflow is lower in the patient with IIH compared with the control subject. Disturbed CSF homeostasis, primarily due to impaired CSF absorption,3,4,19 is a prevailing hypothesis for the cause of elevated intracranial pressure in IIH. The lack of ventricular expansion, which occurs in other etiologies associated with impaired CSF absorption, but not in IIH, steered the focus away from this hypothesis, despite early data documenting larger subarachnoid spaces in IIH.9 The present study employs 3D-volumetric acquisition with 1-mm isotropic resolution, together with a well-tested semiautomated segmentation, to carefully measure intracranial parenchyma and CSF volumes to assess whether extraventricular CSF volume is indeed larger in IIH. Effort was made to study a homogeneous patient population of newly diagnosed untreated overweight female patients with IIH and a well-matched overweight female control group. While ventricular volumes in IIH are maintained at normal range, there is a significant increase in extraventricular CSF and interstitial fluid volumes in the IIH cohort. These results confirm that IIH in obese female subjects is associated with increased intracranial CSF volume that accumulates outside the ventricles. This finding is consistent with the frequent occurrences of posterior globe flattening and papilledema in IIH, because larger subarachnoid CSF spaces adjacent to the floor of the anterior cranial fossa facilitate transmission of the increased CSF pressure to the optic nerve and globe regions. The sensitivity of the extraventricular volume measurement as a marker of IIH is further strengthened when intersubject variability in ICV is accounted for through normalization with respect to ICV. The normalized extraventricular CSF volume had the highest sensitivity and specificity for differentiating between the IIH and the control subjects compared with the other volumetric measures. The finding of larger GM volume in IIH is somewhat unexpected. However, GM volume includes interstitial fluid and blood, and therefore larger GM volume may be explained by increased interstitial fluid or blood volume, which has been suggested as a potential mechanism for the elevated intracranial pressure in IIH.3 Furthermore, greater water and blood volume content in GM compared with WM potentially explains why GM volume and not WM volume was found to be significantly larger in IIH. The increased intracranial CSF volume in obesity-related IIH is consistent with a recently reported finding of a smaller spinal-canal/intracranial compliance ratio in obese female patients with IIH compared with control subjects.20 Lower spinal canal compliance contribution implies reduced ability to accommodate additional volumes of CSF in the spinal canal, thereby facilitating CSF accumulation in the cranial compartment. In the current study, total CBF and relative drainage through the internal jugular veins, the primary drainage channel in the supine position, were assessed to test previously suggested mechanisms of loss of cerebral autoregulation21 and/or altered venous hemodynamics in IIH.5 A loss of CBF autoregulation was concluded based on a finding of 55% higher total arterial inflow, with a mean value of 1320 ± 270 mL/min, in 12 patients with IIH categorized to have an extrinsic venous outflow obstruction.21,22 In contrast to these studies, a normal mean total arterial inflow of 823 ± 68 mL/min was measured in the current study, suggesting an intact cerebral autoregulation in obesity-associated IIH. A possible explanation for the discrepancy may lie in the different patient cohorts. Bateman's study21 included a heterogeneous group of patients of a wide age range (10–52 years) including a 10-year-old male subject with a total arterial inflow of nearly 2 L/min,21 compared with the homogeneous sample of all-female obese patients with IIH aged 17–44 years in the current study. While total CBF is normal in the present IIH cohort, drainage through the internal jugular veins is significantly reduced, with a mean value of 0.65 ± 0.07 compared with 0.81 ± 0.1 in the control cohort. This finding is consistent with an earlier report demonstrating a higher flow through secondary venous outflow channels, such as the epidural and vertebral veins, normalized for total arterial inflow in IIH.5 Higher relative drainage through secondary channels compensates for the lower drainage through primary channels, as total venous outflow remains equal to arterial inflow in steady state. In summary, the current study confirms that IIH in obese women who present with headaches and papilledema is associated with an increased cranial CSF volume that accumulates outside the ventricles. The present study confirms the earlier prediction based on theoretic modeling that intracranial CSF accumulation resulting from impaired CSF homeostasis can occur without ventricular expansion.23 In addition to increased cranial CSF volume, the same IIH patient cohort also demonstrated altered venous hemodynamics, suggesting an increased venous outflow resistance. The finding of increased venous outflow resistance, together with the observed increase in GM interstitial fluid volume, supports the hypothesis that interstitial fluid and/or blood volume is increased in IIH. Therefore, the independent observations of increased intracranial CSF volumes and altered venous outflow in the same IIH cohort provide strong evidence that the previously suggested mechanisms of impaired CSF homeostasis and venous outflow coexist in obesity-related IIH. A limitation of the study is the exclusion of the CSF spaces around the optic nerves and orbits. These regions were not accounted for in the overall CSF volume because they are not identified as part of the cranial vault by the segmentation method. However, these CSF spaces comprise only a small volume and are thus unlikely to change the findings of the study. Quantitative volumetric 3D MR imaging for assessment of intracranial tissues and CSF volumes in conjunction with quantitation of total CBF and venous drainage through the internal jugular veins demonstrates the coexistence of impaired CSF homeostasis and altered venous hemodynamics in obesity-related IIH. Therefore, these quantitative measures, in addition to previously proposed predictors,24 may be useful for establishing a diagnosis of obesity-associated IIH. The authors thank Dr. Robert Quencer for departmental support. This research was supported in part by the National Institutes of Health (R01NS052122). Accepted after revision March 30, 2012.